This exhibit contains digitized items that highlight the Administration’s commitment to Education Reform through increasing investments and raising standards. This exhibit focuses on President Clinton’s efforts to reform education in the State of Arkansas, the Goals 2000: Educate America Act and the Elementary and Secondary Education Act (ESEA). This exhibit provides access to more than 1,000 digitized files related to Education Reform. 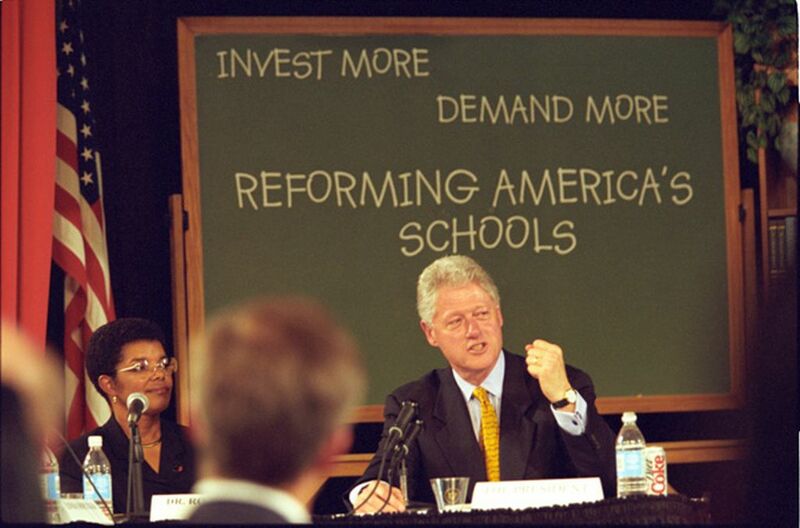 Improving education was a cornerstone of the Clinton Administration. President Clinton helped raise expectations for all students and invested in proven strategies to elevate educational performance. The Clinton Administration supported states in developing rigorous standards, systems of assessment, and accountability. While President Clinton invested more in schools, he also demanded more from these schools. This led to remarkable progress in key areas such as implementing standards and accountability, improving student performance, closing the achievement gap, expanding access to technology, and making higher education more affordable.